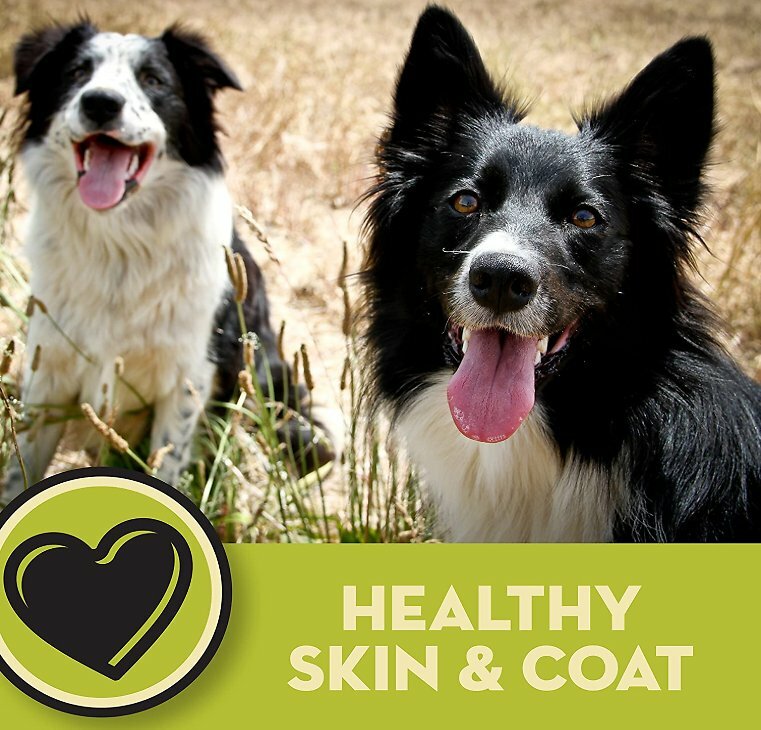 AvoDerm premium dog and cat food formulas are loaded with high quality meat proteins, wholesome grains, antioxidant nutrients plus vitamins and minerals for inside health and California avocados for healthy skin and coat on the outside. Adjust feeding to maintain optimum weight. 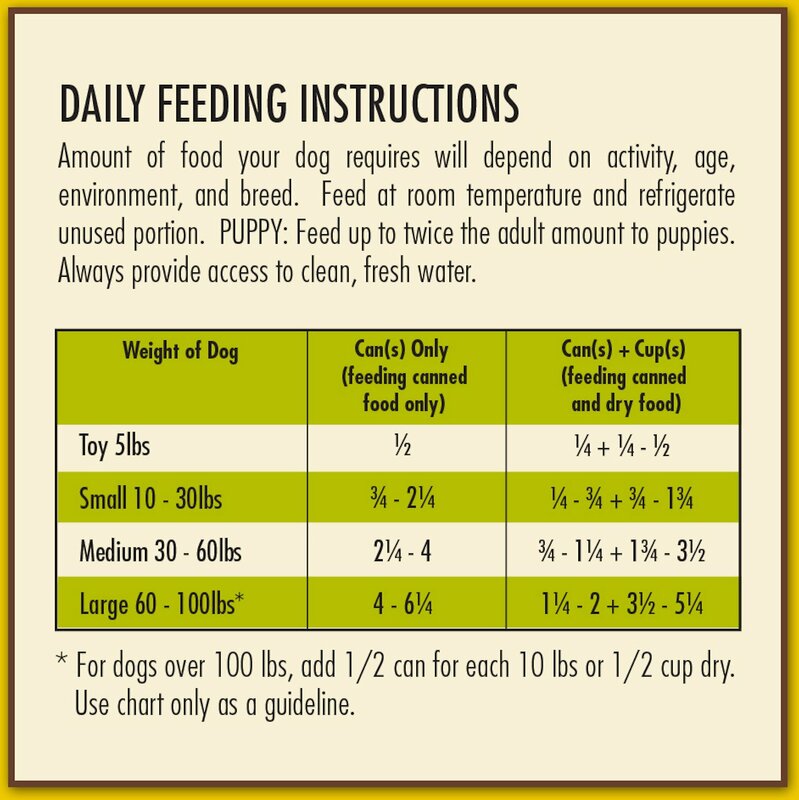 Amount of food your dog requires will depend on activity, age, environment, and breed. Feed at room temperature and refrigerate unused portion. 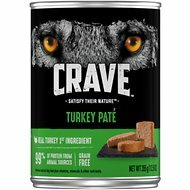 My dogs really love this, and my Chihuahua/IG who has had skin and tummy troubles with chicken and beef based foods, has no problem with the turkey stew. I love that I can see actual peas, carrots, and potatoes--instead of a can of indistinguishable mush. 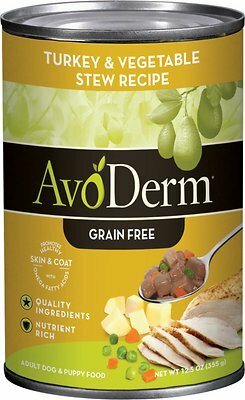 I just wish it contained some grains--with everything in the news about grain free foods causing heart problems, some rice would certainly be welcome in this food. Our girl is a very picky eater...she gobbled this right up! The delivery was not 1-2 days as promised it took five days (and arrived later in the day)and we had to go out to buy food to fill in the gap for our 16 week old puppy. She also did not find this food very enticing and usually did not find it interesting. 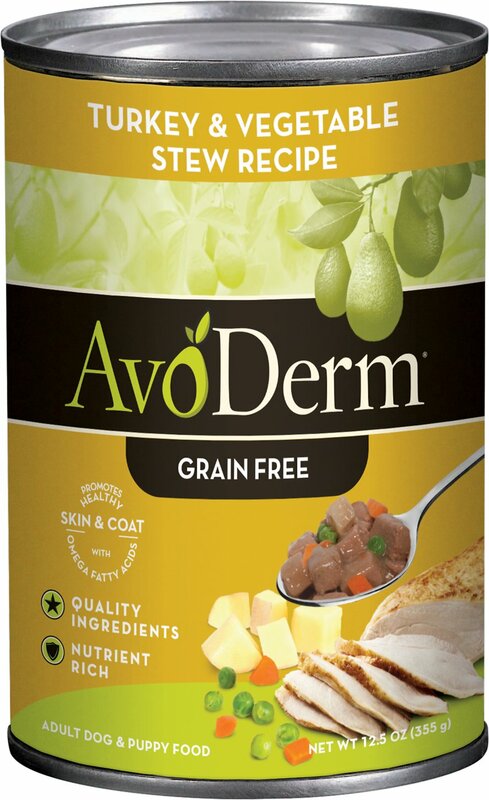 Our akita loves a topping of this stew....far prefer this to the pate. A good mixture. Was happy to get this variety of AvoDerm for such a reasonable price. 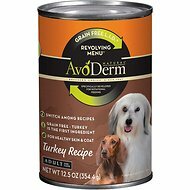 The dogs love this and will order again. The shipping was free and received in just a few days. 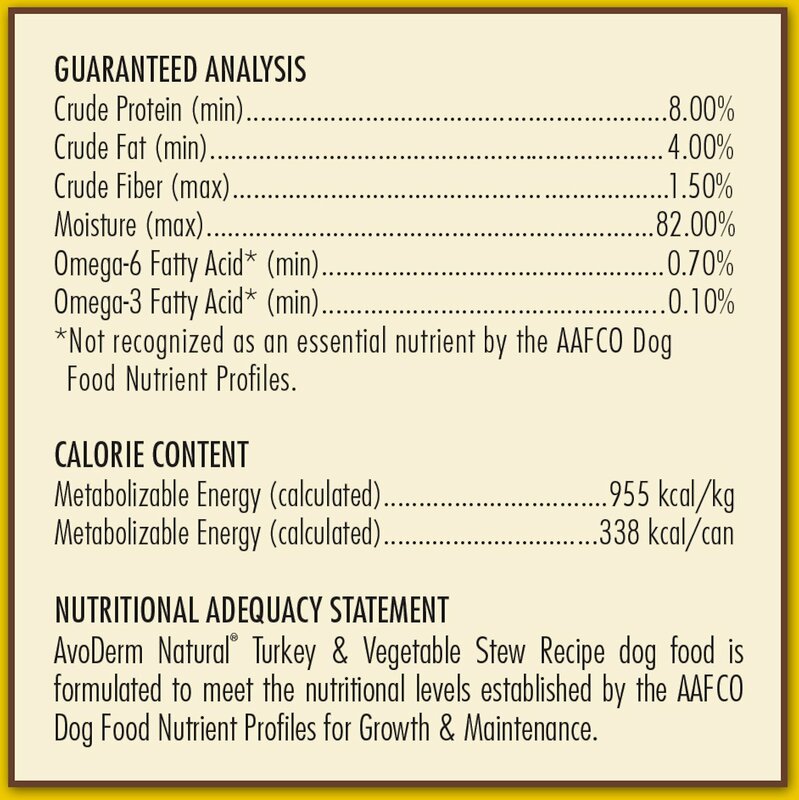 Great dog food. 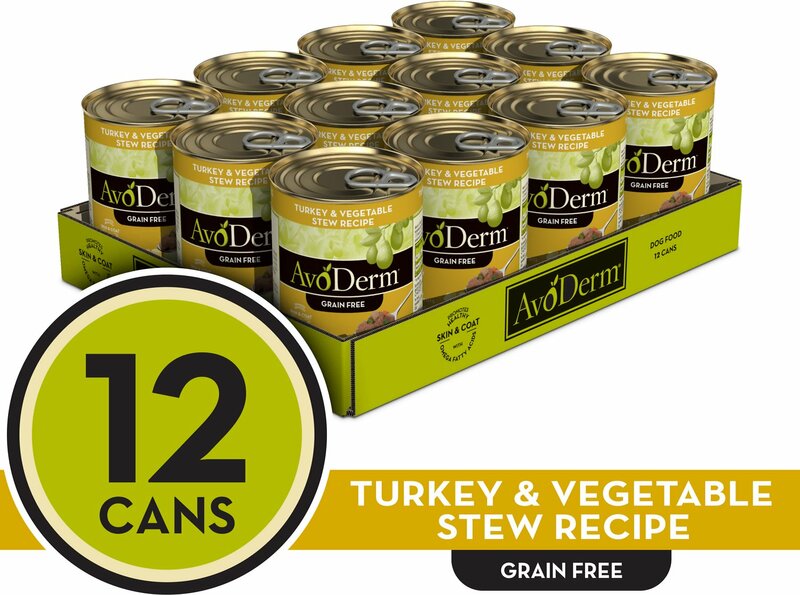 One of my dogs cannot have chicken or beef products so this canned dog food is great. Plus buying from your store is much, much cheaper than what I was paying at the pet store. My dogs love this wet food! My dogs inhale their food when I use this as a topper to their dry food. It looks good and smells alright too. The chunks of meat are small so it's easy to mix in. I'll definitely buy this food again! I got this so I could feed to both dogs. 1 is 6 and the other is 5 months. I have to say both dogs love it. As soon as I put in there bowls they eat every little nite and then lick the bowl clean. I would recommend to everyone. Puppy loves it. Looks like stew, meaty bits with vegetables. No bad smells like some.